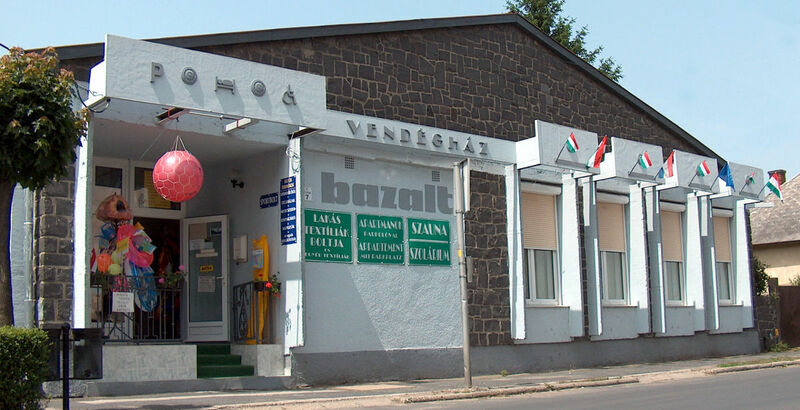 The Balaton Bazalt Guesthouse is located on the north-western shore of Lake Balaton in Hungary, at only 300 meters walking distance from the beach, in the centre of Badacsonytomaj village. The Balaton Bazalt Guesthouse, with 55 beds, consists of several buildings, located in a closed garden. In the main building, which contains an atrium, the 1 and 2 room appartments (2 till 6 persons per appartment) can be found, all a with shower and toilet. A separate kitchen/diningroom is provided for these appartments. You may also rent our bungalow, which has 2 completely furnished rooms, a bathroom, separate toilet, and television. The rear part of the Balaton Bazalt Guesthouse is ideal for low-budget visitors; it contains several rooms for 2 persons each, with a common kitchenette and bathroom. The garden provides parking space, a children’s corner, as well as a barbeque and garden furniture. The Balaton Bazalt Guesthouse further contains a sauna and solarium. Extra beds can be provided for all rooms. We are open around the year. Because of it’s central location, shops, restaurants, church, post-office, bank, pharmacy and the railway station can be found within a few minutes walking distance. Maximum accomodation for 41 persons in Summer, 26 persons in Winter. We are open all around the year. © 2004-2019 Balaton Bazalt Vendégház – Thassos Bt.